Conscious that many people appreciate having time to plan their annual retreat, we would like to draw your attention to Epiphany Group members who regularly offer individually guided Ignatian retreats across the country. Most venues have their own websites with information on what each offers by way of accommodation, programmed retreats and/or on low income. Short, midweek, retreat breaks are available at a comfortable cottage in the lovely village of Coldingham in the Scottish Borders. This cottage – suitable for self-catering mini retreats – is owned by an EG trained spiritual director / prayer guide. It is normally available from Tuesday evenings to Thursday evenings. In a quiet location, it has 2 en-suite bedrooms, a kitchen/dining room, a sitting room and a garden room which looks on to a private terraced garden with a back gate and path leading to the beach at Coldingham Bay. Cost:a donation of £30 to cover heating/lighting/laundry would be appreciated (and a willingness to strip beds and leave rooms clean and tidy). For further enquiries and to book, please contact: Noreen Thompson on 01890 771795 or 07817 990298. Blackruthven, Perthshire, welcomes those who seek individually guided Ignatian retreats as well as Ignatian Spiritual Direction. The resident team also offers a wide range of themed and programmed retreats throughout the year in this lovingly restored and natural environment. Kilmuir, North Kessock, nr Inverness. 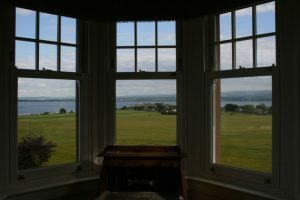 Situated on the banks of the Moray Firth, this lovely small retreat house offers both programmed retreats and the option to book your own time, with individual guidance from experienced Ignatian directors. Individually guided retreats, by members of the Epiphany Group, can be offered at Emmaus House in the centre of Edinburgh by arrangement.